Were alternatives to light rail fully considered? Late last year a caller to 666 Chief Minister Talkback asked then Chief Minister Katy Gallagher why letters the caller had individually addressed to each Legislative Assembly member had not been received. Ms Gallagher’s response was that the letters were opened and forwarded to the appropriate minister, as per standard practice. These letters each contained technical information on an alternative to Canberra’s light rail system. The intention was to make each member aware that there were other options and at least one of these was both faster and cheaper than trams. If the individual members had such information, they could have participated much more meaningfully in the debate over transport options. The interception of this information prevented meaningful and knowledgeable debate on what is a very expensive proposal. The implementation of a new transport system will inevitably change the face of Canberra permanently for good or ill, so coming to the optimum solution is imperative. More generally, how can we have a democratic political system when first hand primary sources of information appear to be purposefully kept from our elected representatives. This is just one example, but it leads me to question how much primary data has been diverted away from our elected Assembly members over the years. This must be seriously affecting the quality of the decisions being made by our governing body and the consequences which flow on result in our having a poorer governed community. Good decision making is only possible when all the facts are known. One can only wonder about the reasons for diverting information away from Assembly members, so that they generally have to work only on the information provided by the relevant ministers. Subsequently the same person called 666 Chief Minister talkback earlier this year and spoke to Chief Minister Andrew Barr. The caller asked him about the lack of due process in selecting a transport system for Canberra and why transport solutions other than trams or buses were not considered. Minister Barr appeared somewhat surprised and asked if there were alternatives. When told there were, he asked for details which the caller provided to the assembly entry that afternoon. The folder of technical information was handed to someone purporting to be from the Chief Minister’s office, who said he was aware of the Chief minister’s on-air request. On checking with the Chief Minister’s office several days later, the caller was told that the folder had disappeared. Minister Barr’s office responded to the caller’s on-air query regarding the lack of due diligence in the selection process, but the letter did not address that issue at all. The caller then wrote a detailed answer to that letter which was then included in a third copy of the technical information folder. This folder and the letter were taken down to the ABC office in Dickson during a subsequent Chief Minister talkback. It was taken into the studio and presumably handed to the Minister Barr or his staff by an senior ABC staff member, but no acknowledgement for the technical information nor to the letter has been received to date. As noted above, all the disappearing folders contained technical information on an alternative to the tram. The example included in these folders was for a light weight overhead rapid transit system which would suspended on poles above the roadway. Hence it would not be slowed by other traffic, nor would it interfere with the flow of other traffic on the road below. But this is just one alternative of several which could do the job better and cheaper than trams or buses. Any project of this magnitude should have been fully investigated before committing to any one technology. After all, the electric tram dates back to the mid 1880s, surely there has been some technical advances since then, real advances, not just jazzed up fancy bodywork on essentially 130 year old bogies. Detailed searches did not uncover any technical investigations of transport options having been done in the past, only financial viability reports done by accounting firms on tram/light rail systems, with a bit also on the cost of express buses on bus lanes (which were a cheaper option and had similar trip times). Nothing else showed up in this search and various ministers in the past have confirmed in public meetings that trams were the only option considered. The whole tram/light rail is saga is a dark, mysterious, dismal, impenetrable swamp. The secrecy is very likely to be hiding all sorts of hidden pitfalls and quicksand pools. The problem however is that the hidden dangers will not really affect those responsible for the pitfalls, which could well bring the project down. The defects and costs will all ultimately be sheeted home to the ACT taxpayers, who will have to pay for the flawed transport decision making process, not the perpetrators! All too often these perpetrators move on leaving the mess behind for others to face. Before committing to any transport mode a full independent investigation of all available options available should have been carried out. Capital costs, running costs, noise, convenience, speed/ travel times, environmental impact etc. should all have been evaluated for each transport mode and the results for each published for all to see before moving on to the design stage. Only by fulfilling these due diligence investigations can the best solution for the long term be implemented. If a private institution were to embark on a project of the magnitude of the tram system without doing due diligence investigations and picked an inferior system which resulted in the shareholders later having to shoulder unnecessarily large debts, there would be serious consequences. The fact that far better and cheaper options were available would cause the financial watchdogs to come down on the institution’s management like a ton of bricks, large fines would be likely to be levied at the very least. So why is the ACT Legislative Assembly able to adopt a scheme when their shareholders, the residents, have to shoulder unnecessarily large debts when a full investigation has not been done to compare all options, some of which appear to be cheaper, less damaging and faster? The system referred to above is only one of the available options which could meet our transport needs into the future & whatever we do, will transform our city forever. Without a full, transparent, independent investigation we will never know just what we may be missing, nor how much money we may have saved. Fares cover 36 percent of costs; is that to be celebrated? Given that this program has been such a success, I propose that the state give everyone a car, then pay 64 percent of the insurance, fuel, maintenance and registration costs of operating it. I bet this program will be so popular we won’t need light rail anymore. Next, the state should give everyone a house, and pay 64 percent of the insurance, property tax, utilities and maintenance costs. I’m sure this program will be tremendously popular, too. So how is this any different to any other government project? Have our rego fees gone up to cover the cost of say Majura Parkway? Do we pay a toll? Nope. So here is a road that has a large capital cost and on going maintenance liability yet is recovering recovering 0% of its true cost but that is ok isn’t it? Yet here is a project that is at least covering part of its costs so yeah maybe should be celebrated. So why should public transport projects be any different? You have missed the point entirely – try substituting”operating costs” for “costs”. The capital cost of the Majura Parkway was largely funded by the Commonwealth – there is no direct funding from the Commonwealth for the tram. All your examples of doom are because of a NON-EXISTENT Light Rail? These are CURRENT examples of businesses failing or fleeing Canberra, so are OBVIOUSLY due to the vast amount of money that has been spent on the failed FREEWAYS! There can be no other logical explanation. No – not at all. 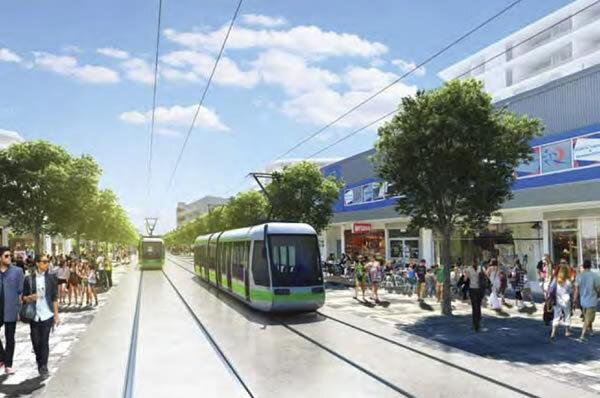 If Light rail rolls connects all CBD + airport as the ACT Labor Greens Gov’t claims it will, the payments to the PPP out of the Territory budget pa for the next 25+ years can not be used to stimulate business growth and employment. Does anyone seriously think that Light rail will bring more shoppers into the CBDs – to lug their heavy shopping bags onto/off the tram the walk to their house/unit or get on a bus ? No. It is only good for commuters + those going out on the grog so (understanberably) dont want to drive. This will be at the expense of businesses generally. My small company is now paying an extra $12k per year due to ACT Labor raising taxes to pay for their ill-conceived train. But that’s just the beginning. When the cost overruns occur, and we find out that patronage was grossly overestimated we’ll find that this train is a perennial expense for ACT voters. It’s a shame what ACT Labor is doing to this city. I heard a claim on the radio from some infrastructure dude that to extend the Light Rail to all claimed CBDs will cost b$10-11 + cost of crossing LBG. Thats based on m$780 – b$1. People have to remember that on top of the capital cost being met by the PPP contractor, there will be their profit, a hedge against unplanned costs, variations in passenger numbers (unless underwritten by the ACT Gov’t), risk, etc. I also know a small company in Mitchell (in leased premises) that was moving to QLD because cost of doing business here – including the rapidly increasing Commercial Rates (like residential Annual Rates – an ACT Gov’t charge). At the end of the day, if u live in Canberra, you will need more $ in wages because of the rapidly increasing cost of living here (which i expect will get worse with the Light Rail costs over 20+ years, more MLAs, more PPPs, more unnecessary infrastructure projects and the Territory’s record budget deficit = increasing ACT Govt charges to cover). That will help to make the cost of labour (wages) sourced from Canberra increasingly uncompetitive to employers/businesses to remain here or establish here. The ACTs revenue raising base to pay for Public Private Partnerships for infrastructure projects simply isn’t anywhere as large as available to the NSW/Vic/Qld, etc. We need significant federal funding for major infrastructure projects – or the cost of Canberra “growing up” will be too much. The Fed’s rejected the ACT Gov’t request for Light Rail funding. The ACT Government had public servants (surely on paid overtime) among the patchouli oil stands and second-hand clothing racks at the Ainslie Shops party this morning spruiking the light rail project at a stall – handing out an extraordinary ACT Government map showing light rail all over Canberra! Like, from outer Belconnen down to Lanyon – about ten times our current near-billion-dollar one leg of light rail. Clearly they think we’re all stupid and believe that Canberrans can stump up multi-billions out of our constrained budget. The spruikers couldn’t answer the most simple questioning about why buses down Northbourne Avenue are considered a worse option – when they could counter any projected congestion at less than a tenth of the cost of light rail, by simply putting on as many buses as needed, and blocking off car lanes (and keeping the trees that are visitors’ visual welcome to Canberra). Said public servant stallholders said that “the wear and tear on the ashphalt down Northbourne, and maintaining the road surface, costs more than light rail would cost”. ! Memo to Andrew Barr: if you don’t give your public servants a cogent set of talking points they just sound silly – but at least you aren’t actually controlling the message and your on-the-ground public servants do keep letting slip that they aren’t convinced themselves. Re the comparative costs of building a light rail and maintaining Northbourne Avenue’s road surfaces, this mean we are going to be burdened with another billion dollars when it comes time to asphalting it or does it mean they are planning to close Northbourne Avenue to all road traffic? It is time that some of these promoters of the light rail are made accountable for their outrageous claims. Unfortunately ACT Labor has a history of ignoring public comment and going its own way with its pet projects. This light rail project is going to cost a fortune and, since ACT Labor often runs into budgetary problems, we’re likely to see this project have a cost overrun. This project isn’t very popular with the community, in-fact I don’t know anyone that supports it, and I don’t think it’s a very intelligent project. The majority of the patronage on the train will be from bus commuters deciding to catch the train instead. I think the train will have minimal impact on road congestion particularly in an area like Gungahlin where many parents can’t catch as bus or train to work as they need their cars nearby for child transport and in case there’s a problem during the day at school. Trains are a great idea in cities such as Melbourne when you’re visiting the shops or sight-seeing and want to go from one shopping district or attraction to another. Dickson restaurants and the City might be places where people are interested in going, but there’s little of interest in Gungahlin… actually there’s Gold Creek, but the train doesn’t go anywhere near it. I live in Gungahlin, and apart from taking the kids on a few fun train rides each year I seriously can’t see how I would benefit from this train. I also cringe to think that they are going to rip up the beautiful tree-lined median strip on Northbourne Avenue for this eyesore. ……. they still only have barely one occupant in them even during peak hours. The simple explanation for this is that not everybody is going to the same place and public transport will not get them all to where they are going in the time frame that they are required to get there. Cars allow for flexibility, public transport is rigid in its timetables, occupancy and routes. Workplaces are also rigid in their timetables and location thus creating the need for peak hour. If only business hours were stretched out and workplaces moved to where people lived there’d be no need for major transport infrastructure of any kind. Problem solved. Ask anyone sitting on Parks Way at 8:00 AM why they aren’t catching a bus and you’d get the same answers. They won’t pick up and drop off where the person needs to, are usually full and will not get them there in sufficient time. Trams will be even less flexible. Certainly not a solution to any transport problem. You need to get with the programe wildturkeycanoe and stop talking logic and common sense. This is what happens when the ACT Government, Canberra Metro and their highly paid consultants, in all their immense wisdom, do not properly and fully evaluate and compare alternative solutions – as correctly stated here by Arthur Davies. The CBD-CBD solution is just half baked and unaffordable. Shows with crystal clarity the “thinking” behind the car obsessed. Doesn’t mention the 32,500 seriously injured or the $27 billion/year cost of road crashes, which consume 18% of health expenditure and 1.8% of GDP. Ha, ha, ha….got ya nice and riled up didn’t I. As if I was using this as a serious argument for supporting motor vehicles as opposed to public transport. It was quite delighted to point out using this example that you yourself have drifted from the topic also, being primarily about alternatives to the tram rather than why cars are the root of all evil. Road death statistics do not give any weight to arguing in favor of trams over other public transport options, I hardly think anyone here is against safer transport options, but going off on an “eco-friendly, green only, cycling is the answer, the world is doomed because of fossil fuels” tangent doesn’t help us understand why the government won’t listen to reason when spending billions on something that is proven time and time again to be both ineffective at solving the problem and costs so much our grandchildren’s children will be paying it off. The major cost of “light rail” is the foundations. Have a look at images of typical systems being built, continuous heavily reinforced very thick concrete to hold the rails. Trams seem to weigh around 25t & more, pod cars weigh around 0.4T (400kg). The bored pole foundations are far smaller ? cheaper by comparison. The gold coast line even had to have deep piles below the foundations! I will check on the cost of the small stations & report further. True trams are heavy, but extremely durable, hundred year old trams are still running happily on the museum line in S.F. In Zurich and Graz, and I assume elsewhere, the tram lines were laid in the ground on concrete sleepers with grass laid in between. Once in place, that’s it. They need virtually no maintenance, certainly way less than roads. You get what you pay for. With trams it is up front and the benefits last forever. The Gold Coast is built on a sandbar, everything there needs deep footings. The pods may be light weight but that doesn’t mean the structures that support them can be. The proposal has people suspended high up, travelling at high speed. The only thing keeping them up there is the poles on the sides of roads, which do occasionally get struck by other vehicles. And I still don’t get the switching mechanism, which has no details. It instantly attracts my attention as a source of problems. The access to the very low capacity pods is the Achilles Heel of this project, that and the B-grade 50’s Sci-Fi props the inventor shows off in his videos, the ones that aren’t knocked together 3D-Max animations by some kid using his home PC. I have to worry about this project if they can’t even competently fake the visuals. Do you have any idea of just how much it costs to put in and maintain open air public lifts and escalators? You are asking for both on every stop for this system! The same for a 2 storey platform to hold waiting passengers. This is not a treehouse, and I still have not seen a sensible solution for getting into the pods. For safety there would have to be a cantilevered floor under where it pulls up. The “simple” elevated stops just keep growing and growing. Not that they are shown consistently anywhere in the mock-ups. The half kilometre Tel-Aviv loop would be better built as a bike track. As if the geeks on the campus should avoid even the most minimal of exercise! I don’t know exactly what you are getting out of this but my B.S. detector instantly flipped when you talked about yourself as some mystery third person all the time, to make it all seem more significant and less cranky. It certainly doesn’t bode well for the overall honesty of the SkyTran Pod proposal, which as it stands is just vapourware. I have checked the cost of the small suburban/intermediate stations, around 400,000 ea. Metro have allowed 10 or 12 stations for stage 1, I think 20 would be better for a rapid transit system. Total cost for the small stations would be around $8M, not a lot for a system which would cost around $300M all up (compared with &800M for trams). Some of the comments seem to be getting off the main topic which was that the Govt did NOT investigate ALL the transport options before opting for trams. If trams proved to be best after proper fully documented publicly available investigations, so be it. But, I for one, think that would be a highly unlikely outcome. But the irresponsible process is the real issue. In 2011, there were 1,544 deaths from melanoma of the skin, whilst there were only 1291 deaths on Australian roads in the same year. Perhaps being outside in the sun walking and cycling isn’t as healthy a transport solution as claimed. I wouldn’t go using any sort of comparative analysis, wildyurkeycanoe. That wasn’t done to any depth for the adoption of a Gunners-City CBD-CBD toy train set, no doubt because it would get in the way of the pro spin. We never EVER get any analysis of the repeated mistakes of throwing away billions of dollars of taxpayer money on freeways. Guaranteed to lose money because they never make any. That then cost enormous amounts of money, lives and debt to run. Unaccounted for by those who sweep the real cost under the “Road Carpet”. Cars are a “special” unaccountable category that you throw money at, knowing they are never the ultimate solution, but people reach for, just like that instinctive greasy burger when someone mentions obesity. But then there are the ludicrous arguments like the unconnected melanoma vs the actual deaths and injuries to road victims! Hard to argue with the incoherent. I find it fascinating that 1291 deaths and 44,303 serious injuries, $27 billion/year hospital costs that eats up 18% of the health budget doesn’t register, just get ignored like all the other real costs of relying on fossil fuelled vehicles. We all know that the car addiction is no more looking for rational arguments than any other addiction. There was the usual “Why don’t they spend the money on hospitals?” argument earlier. No, let’s spend billions on more cars and freeways to PUT people into the hospitals and PUT us into the mess we find ourselves in. If we have bad suburban sprawl, traffic jams, disconnected urban planning and ridiculously expensive parking, it can’t be blamed on trams we don’t have. Instead look at the roads that have eaten up 55% the “Garden Capital” and are still chewing into the landscape. The usual “toy” thinking put up as “fiscal responsibility”, by conservatives who have just been off to the pawnbrokers with public assets that they don’t own to blow it all on things they claim THEY “need” and that run up huge government debt, to cause the maximum damage to the City and the environment. From sitting inside public transport? Where are the ACTUAL Public Transport deaths? Not double counting those of the Darwin Awarders, slamming into Public Transport in their cars and trucks. Guess that is why the melanoma furphy. Drivers NEVER get out of their cars. Which is why the largest killer by far is heart problems and diabetes. As usual you manage to grab the wrong end of the stick and wave it around as a distraction from the real problem. Did you say 1,544 from melanoma? With absolutely no causal link with public transport. What about 44,303 deaths due to cardio-vascular disease? 50% of which is directly caused by diabetes.